BLOG: "I was at Gibson the day Les Paul died"
Although I'm not particularly known for my prescience, yesterday morning I experienced one of those feelings where I could tell something was wrong before I knew what exactly it was. I'm talking about the death of Les Paul. The distance from the curb to the entrance of the Gibson Showroom on 54th Street in New York City is perhaps six steps, and as I made my way from the cab to the doorbell, I felt a strange sensation that all was not right. The sky overhead was turning cloudy. It's going to rain any minute, I thought. The reason for my visit to Gibson's hip Manhattan headquarters was to hang with former KISS guitarist Ace Frehley and interview him about his upcoming solo record. I was escorted to a mid-sized studio in the facility by a staff member. He seemed somber, distracted. I didn't think anything of it, really - maybe he was having a bad day. Happens. Frehley was several minutes late (rock stars are never known for their punctuality), so I killed a little time in the studio, checking out my recording gear and admiring some of the instruments that were sitting around. A well-worn Slingerland drum kit caught my eye, so I took and seat and started playing. A minute later, the studio door opened and a different staffer appeared. He had an odd look on his face. "Too loud?" I said, rising to my feet. "If so, I'll stop." "No, it's not that," he said. Cocking his head slightly, he looked at me curiously and said, "You...you didn't hear, did you?" Before I could say, "Hear what?" he came right out with it: "Les Paul died today. We just got the news a little bit ago. We're all in a state of shock. Les was like...well, he was family." I stood there numbly and absorbed what I'd just been told. Working on auto-pilot, I called MusicRadar's offices in the UK and delivered the news. Just then, the door opened again and Ace Frehley walked in. He was wearing sunglasses, but I could tell they were covering troubled eyes. "You heard?" he asked grimly. "Yeah, just now," I answered. There was an awkward few seconds, that "OK, what should we do?" feeling that two people silently share in situations like this. We both knew we had jobs to do and schedules to keep, so we decided to start the interview. I put my notes aside and asked Frehley about Les Paul. The guitarist heaved a full body sigh and his words came quickly; he didn't need time to think: "He was a friend of mine. I jammed with him. He was one of the sweetest guys I ever knew. He was an institution. He designed one of the greatest guitars in rock history, and I'm...I'm quite saddened by it. He will be missed greatly." And with that, the two of us shifted gears and got down to matters at hand, discussing Frehley's solo album and guitar playing. 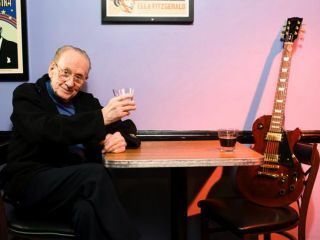 There seemed to be a unspoken sense that Les Paul would have wanted it that way: Just get on with it already. It's all about the music anyway. Even so, the sight of various Les Paul guitars situated about the studio served as a constant reminder that the man who built the house we were sitting in was gone.